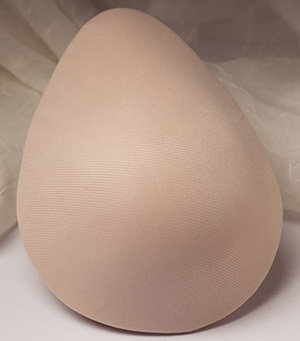 This foam form is full in the front with a slightly concave back and has a short, single wing that allows the breast from to be turned in several directions for the best fit. Made from a unique polyurethane foam that is both durable and soft, and is covered in a smooth polyester fabric. Extremely comfortable and ultra lightweight. We recommend this breast form for sleeping, leisurewear and swimming, and can easily be fit in to an after-surgery camisole or a bathing suit. Durable, washable, and made in the United States of America.